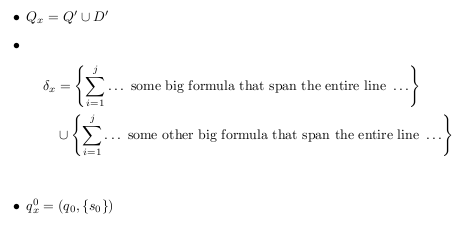 I would like to use a multiline equation into an itemized list, but such that the bullet of the list is aligned with the first line of my equation. Any idea how to align the bullet with the first line? Not the answer you're looking for? Browse other questions tagged equations lists vertical-alignment itemize or ask your own question. Is it possible to use the enumerate/itemize environment within the proof/remark environment in a nice way?